Dr. Yaremchuk employs his knowledge and experience with craniofacial surgery and biomaterials to create new facial skeletal contours. Using facial implants he can mimic the facial appearance obtained with more extensive facial skeletal surgeries. Click for an overview of how facial skeletal augmentation can mimic the appearance obtained with skeletal osteotomies. Many implant procedures can be done on an out-patient basis. When surgery is more extensive, patients can spend the night of surgery in our surgical facility under the attentive care of our registered nurses. As an expert on altering the facial skeleton for cosmetic and reconstructive purposes, Dr. Yaremchuk lectures nationally and internationally and has written several book chapters and scientific articles on these topics. 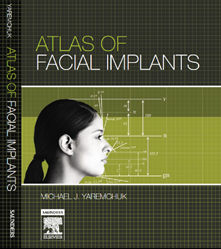 His book, "Atlas of Facial Implants", was awarded an Association of Medical Illustrators Award for surgical atlases. Its second edition is now in press. Scientific articles and chapters written by Dr Yaremchuk have addressed each anatomic area amenable to implant augmentation. His writings also describe the use of facial implants both for facial rejuvenation, and also as adjuncts or alternatives to orthognathic surgery. These include "Alloplastic Augmentation of the Facial Skeleton: An Occasional Adjunct or Alternative to Orthognathic Surgery" and "Aging of the Facial Skeleton: Aesthetic Implications and Rejuvenation Strategies." As a testament to Dr. Yaremchuk's extensive expertise in this area, Matrix Surgical, an international manufacturer and distributor of plastic surgery products, signed a licensing agreement to manufacture and distribute his patented innovative facial implants in spring 2014. In addition to these "off-the shelf" implants, implants can be made custom-made for a patient’s unique facial structure and desired aesthetic outcomes. If requested when scheduling, 3D CT scans can be obtained on the day of consultation with Dr. Yaremchuk. The three dimensional image reveals the exact underlying skeletal anatomy of the patient. Since one's facial skeleton is the fundamental determinant of their appearance, it can be invaluable to patient understanding during the consultation.The 3D CT makes surgical planning more precise when using both custom and off-the-shelf implants. * Below are planning images derived from a CT following a patient consultation. In this case, the patient desired to correct the asymmetry in her lower jaw, as well as create a more defined chin and more prominent cheek bones. Bespoke facial implants were designed to provide these skeletal changes, which would be reflected in the contours of her soft tissue envelope. * The below image on the left shows the patient's underlying skeleton. The image on the right shows the the custom made bespoke implants overlying her native skeleton. * This patient with hemifacial microsomia had been treated with sagittal split osteotomy, horizontal chin osteotomy and later distraction osteogenesis in attempts to reconstruct a symmetric mandible. * This patient had custom implants placed to augment his deficient chin and mandible.